I’ve used different iFrogz earphones for enough time to call myself a fan. They connect when they need to, offer a fair amount of battery life, and their sound is pretty good too considering the price. The new more premium offering, the iFrogz Impulse Duo Wireless looks to up the sound quality by providing dual 6 mm neodymium drivers for each earbud. The drivers are employed in a smallish square housing, making the earbuds slightly larger at the back than regular ones. This might be a problem for those with tiny ears, since the housing could press against the earlobe. Worn correctly they present slightly outwards, missing any part of the ear and providing a snug fit. Although perhaps not intended as such, if you wear them facing inwards, there is enough pressure from the earlobe to keep them pressed into the ear, allowing you to take these to the gym or for a quick run. 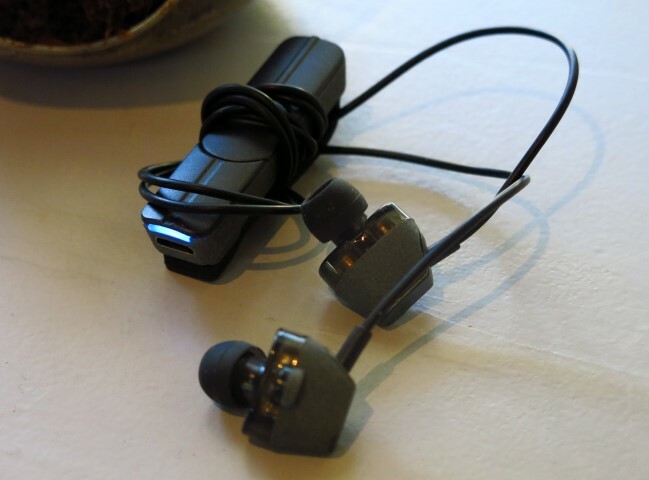 The blocky design of the Impulse Duo Wireless makes them more noticeable when in-ear, with the review unit coming in a stylish grey two tone colour scheme. Since they are slightly larger, I thought they might be a bother to wear for an extended period of time, but they weren’t more so than usual, proving more comfortable for a longer period of time. If you’ve used iFrogz’s in-ear range you’ll know the setup, with the in-line control hub providing options for the pause and play of your tunes and volume up and down. Long press the top and bottom buttons and you can also skip music or podcasts backwards and forwards. It’s an easy solution, which, alongside the magnetic clip, allows you to wind up the cables leading to the earbuds when travelling, or regulate the length of these so that they don’t hang loose. The unit is IPX-2 rated when it comes to water resistance, so don’t worry about sweat spoiling your earphones over time. As far as battery life is concerned, I received about five and a half hours of usage, also taking and making calls in the process. iFrogz states five hours of playing time, with another five on standby, which sounds about right. Since they have a magnetic clip to fasten it to your clothes, I got into the habit of simply hanging them on the fridge close to the charger, and plugging it in once there. Size difference between the Impulse Duo Wireless and Summit Wireless (left). So is the extra drivers worth it when it comes to music quality? Indeed. Much like the regular iFrogz Impulse Wireless earphones where a step up from the more sporty Summit Wireless ones, the Impulse Duo Wireless steps it up a notch. Spatially the sound is better, with improvements noticeable in the mid and high range especially. Everything just sound clearer. I also had fewer problems keeping the Duo Wireless firmly in my ear, consequently providing better sound just by staying closer to the ear canal. Sound quality of calls coming in was really good, while I didn’t receive complaints about voice from those calling. With Google now also omitting the 3.5mm jack on their latest Pixel 2 smartphone, chances are that a number of other manufacturers might just do the same going forward, so wireless Bluetooth earbuds, such as the Impulse Duo Wireless, might just become the go to solution. Google’s wireless Pixel Bud earbuds don’t look like they will be coming to SA, while Apple’s AirPods’ premium price is scaring off more than a few people. If good sound quality - at certainly not the highest price - is what you are after, the Impulse Duo Wireless is worth a look at R799. They fitted well and stayed in the ear, plus the dual-drivers in each earbud does offer a noticeable increase in sound quality. Having said that, the regular Impulse Wireless remains a great choice, especially if you can find them on special retailing for just over R500. FULL DISCLOSURE: iFrogz Impulse Duo Wireless earphones were provided as a seeding unit.